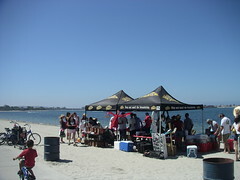 Saturday I went down to Mission Bay to compete in the All Terrain Bocce tournament. It was started by Michael and his girlfriend. He manages a Pat-n-Oscars and she is a rep for Skyy Vodka, so of course the food was top notch! For $20 you get to compete for the championship while enjoying all the food and beverages you can stand. There were something like 100 contestants sprawled out over most of the NE side of the bay. I had fun hurling bocce balls across the boardwalk while people jogged by. I made it as far as the second round, but was soon thrashed by the pro players.